The KPI Metrics for the Internet and Information Technology HandiGuide™ is over 320 pages, defines 540 objective metrics, and contains 83 metric reports that show over 240 objective metrics. The IT Service Management Policy Template is a 78 page document that contains policies, standards, procedures and metrics. 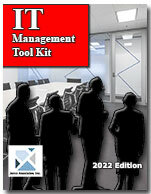 Chapters of the template include: Service Requests Policy, Service Request Standard, Help Desk Policy, Help Desk Standards, Help Desk Procedures, Help Desk Service Level Agreement, Change Control Standard, Change Control Quality Assurance Standard, Change Control Management Workbook, Documentation Standard, Application Version Control Standard, Version Control Standard, Internet, e-Mail and Electronic Communication Policy, and Travel and Off-Site Meeting. The policy defines how to treat Credit Card, Social Security, Employee, and Customer Data. The policy is 15 pages in length. This policy complies with Sarbanes Oxley Section 404. The need to lower cost, increase efficiency and conserve cash has increased the motivation of companies to turn to Cloud Computing and increased the appeal of alternative delivery models. The disruptive shifts in new demand and supply patterns drives changes for how IT services are bought and from whom. Cloud computing requirements need to be well defined.